This year's inaugural talk for the "Muslim Role Model" program had Mrs. Irfan talk about her life in a Madrasa at Buffalo, New York. She talked about how she spent her 5 years in Darul Uloom in Buffalo. She told us that she and her sister had a lovely time there. 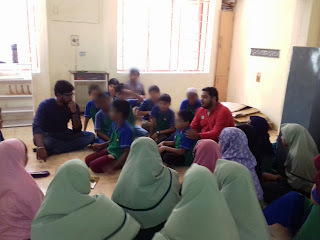 At Darul Uloom, they learned Arabic Grammer, Prophets' stories, Tafseer, Hadith and how to read Quran with Tajweed. She also told us that she learned the details of practising Islam or fiqh. The students couldn't watch TV or hear music. They also had to wash their own clothes. They had to work from 7:30am-10:00pm. They worked really hard in those five years of her life. We study only 7 hours in a day and she studied 15 hours. They learned more advanced Islamic studies but she still had to use Maths to calculate zakah, or inheritance. We learned that we shouldn't be lazy and we should work hard and put our trust in Allah.